I have done several blog posts the past 4 months related to texting. The response has been incredible. We are excited to see this innovation engage guests, regular attenders, members and staff in a new, extremely relevant way. 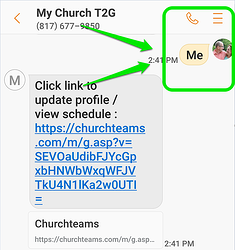 The more we have worked with it, the more we realize the potential of texting as a tool for simple and user-specific interface with your Churchteams database. As of today, I've not heard of anyone else doing the last two of these. In fact text-to-check-in is a candidate for WFX New Product of 2017. However, we're not done innovating. We just released our latest feature. We call it Text-to-ME (see image above). Click the text link (image above) to get to this page. Notice the login link (blue), the Follow Up section (red is completed, green it outstanding assignments), and the Volunteer section (green is accepted invitations, red is declined invitations). Scroll down. Notice the Church Directory and other user-defined Navy links, Groups that I lead, and Update My Information. Thirteen years ago we introduced push-out emails to group leaders. These have proven to be the very best way to get responses from group leader volunteers. We believe these texting options, will be just as significant in giving people unprecedented access to your church database. The key principle, we learned over a decade ago, is to go where people already are. Don't ask them to download or login to something. 20-40% of your people will do this, but there's a better way to get the rest to engage than constantly marketing a product to them. If you're a client and have texting set up already, just text the word ME to see it. If you're a client and need texting, go to Settings / Contributions / Online Giving to get set up with online giving first and then texting. Don't worry if you have another online giving provider, this is inexpensive enough to make it worth it. Ask Bryce to help you with it. If you've been watching Churchteams or considering us, why not jump in now and give us a try? This is a free 30 day trial with no long term contract attached. That's how confident we are that you'll like it!